I have a confession to make. During some of the more, shall we say, challenging of the matches I have struggled with actually remaining conscious. Some of the initial skirmishes, especially as they enter the critical 20 – 35 minute mark, have been tedium incarnate as neither side establishes a cutting edge and we retreat into some kind of footballing trench warfare. But this was the first match where I have actually lost consciousness and fallen asleep. I just couldn’t get my head around the Czech’s gameplan. Sure in this age of the Mourinho Discipline we’ve all got used to sides sitting back and playing the defensive counterattack game, but it seems that the Czech’s never had any ambition beyond keeping the game at nil nil for long periods. Maybe there was some notion that in allowing themselves to be battered for the vast bulk of the game that they were enacting some kind of heroic football equivalent of the ‘rope a dope’. But once again the fatal flaw emerges. Sure Ali may have weathered the storm until Foreman was a broken husk of a man but he only won because he was then able to attack. The Czechs never really got that far. Neither, for all their quality, did Portugal. They too seemed a bit hamstrung by the sense of occasion. In comparison to their demolition of the Dutch, this was a very restrained, almost subdued performance. Once again their centrepiece was Ronnie, but he was far less devastating than his previous game. Now that may have been due to the hard work of the Czech defence (and midfield), but it’s more likely that it was down to the general lackluster nature of the Portuguese team itself. In the end it was a single goal that settled it and inevitably it was Ronnie wot won it. But there was still less gusto than previously. A semi-final with the winners of Day 15’s Spain France clash awaits. Having spent much of the first week gloating about how they used to own most of Eastern Europe while playing easily the best football of the tournament, the Russians must have felt somewhat confident about moving into week 3. While the Greeks, armed only with a legendary pigheadedness and the kind of financial and moral bankruptcy that the rest of the world can only dream of, must have thought that there was no chance of their getting through. How wrong they were. The great thing about this tournament, in comparison with previous Euros and 2010’s World Cup, is that every match in every round has seemed to matter and that, despite many teams buying wholeheartedly into the Mourinho Doctrine, attacking play has reaped rewards. And while we still haven’t seen really classic games, we’ve seen some attractive, exciting and occasionally mind boggling football, not least tonight’s activities. Russia must just be cursing their footballing gods. For pretty much every permutation of results except this one saw them going through. No one expected the Greeks, who were brutally spanked by the Czechs (the Czechs for god’s sake) and outplayed for large periods by the profligate Poles, to do anything against the Russians other than provide a brick wall defence. Still it was all in the Russian’s hands and they both let in a soft goal and failed to do any damage themselves. As if we needed reminding, tournament football is a very different beast from either league or cup football. Teams generally grow into the tournament (as the Spanish did in the World Cup) rather than being uniformly brilliant. The Russians came out all guns blazing and ended up firing blanks, the Greeks started tediously and have improved a little, making the most of the very few chances they had. This was a strange, often tedious game, which was bizarre in the extreme. Both sides knew that a win would see them through yet neither side seemed even remotely interested in attacking. You could forgive the Czechs, as they knew that a draw would see them through, so there was no need for them to risk everything, but the Poles? What were they thinking? Apparently overawed by the weight of expectation of their audience in their opening match, they seemed to be rendered impotent after around 15 minutes. Certainly there’s no excuse for the craven display they put on in the second half. If you thought Engerland’s ball retention was abysmal, you only had to watch Poland in the second half to realise that this was a whole new level of ball incompetence. Not only did they rarely get out of their half (I think their key man Lewandowski had at most a couple of touches during the second period), but they were barely able to string one pass together (let alone two or more). True they weren’t as diabolically shambolic as the Irish, but they illustrate the dangers of awarding tournaments like this to sides who otherwise almost certainly wouldn’t qualify. Or the danger of opening the tournament up to more teams of this low grade quality. Still, if there are crumbs of comfort to take for the Poles, it’s that their best moment, the goal against Russia from Blaszczykowski, was instrumental in sending the Russians packing. Whodathunkit eh? Now, aside from one nice chip over the Polish defence, the Greeks have come bearing the same gifts as usual. Sheer bloody minded obduracy and precious little else. And you know what? That’s been better than good for them since 2004. Here it lasted all of 6 minutes and it was effectively game over. Two sweet strikes and the Greeks were, to all intents and purposes, back on the beach. 3 minutes in bash! the Czechs, no super threats themselves, were one up. 6 minutes in and it was 2. And the Greeks had no answer. As always they were a frustrating mass of carefully organised defence (two easy goals conceded aside), a vague midfield and Georgio Samaras up front. Now Samaras has played at numerous clubs, but essentially he’s a poor man’s Nicklas Bendtner, for him six goals a season for a midtable Prem side would be a massive step up. And he never looked like a threat, much less a goalscoring one here. The only other moment of note was provided by Petr Cech, who attempted to give both Szczesny and Given a run for their money as the most gaff-prone keeper at the tournament. It’s saying a lot that he actually came close to eclipsing both of them with his ill-fated rush and finger fumble, which presented Gekas with the easiest of easy tap ins (the kind not even Milner could miss). Fortunately for Cech, who appears to have used up all his luck in the Champions League final, it wasn’t fatal. Sadly for the rest of us the Greeks could still miraculously qualify from this group. Does this man look happy or what? Pity the poor Poles. Unkindly done in by the Greeks thanks in part to the weight of expectation bearing down on them in the opening match, they had to watch the Ukrainian fairy tale unfold in Matchday 4. Now facing the team of the tournament so far, Russia, they couldn’t afford to lose. Politics, both real world and footballing, demanded some kind of a result. Talk about a pressure game. And having gone a goal down to the Russians, things looked a bit black. If this had been Engerland, you’d have heard all sorts of commentary about Captain Marvel, Terry Butcher etc. Instead we got the story of the tournament so far. A fabulous cracking volley from outside the area from Polish captain and scrabble winning hand Blaszczykowski. The sort of goal that didn’t just get you up from the couch going, “What a goal!”, but lifted up an entire country. Finally, the Poles had found some kind of self-belief and they then turned the tables on the previously dominant Russians and spent the rest of the match attacking their goal. Despite the storybook nature of the Sheva show in Ukraine, this was the best match of the tournament so far, featuring the only team that has played really inspiring (as opposed to effective, efficient or just plain awful) football and a team that needed their own kind of fairytale. With the result of the Czech Greek match, the Poles now have their future in their hands. Beat the Czechs and they’re into the next round. On this evidence they’ve got every chance of joining Russia in the knockout stages. It was the best of times, it was the worst of times and it was all of them at the same time. Co-hosts and comfortably the lowest ranked side in the tournament, Poland, played the poorest (in every sense), Greece. And while there was incident aplenty, there wasn’t much quality football on display. Indeed, if dog years are seven times real person years, then this game was played at giant hound pace. It felt like I’d aged two or three years in the space of the 90 minutes and change that this game lasted. Just as in World Cup 2010, the hosts had all the neutral support and, if we weren’t actively willing Poland to success, we were very definitely gunning for Greek failure, the least their hugely negative tactical viewpoint deserves. And, like the South Africans, the home side scored first. And, at that point they looked firmly in control, their Borussia Dortmund spine looking effective and assured, but they were unable to capitalise on their initial possession. Even when the Greeks had a man sent off they couldn’t make the Greeks squeal. Amazingly, in the second half the Greeks actually began to play as the Polish defence began to show its flaws. You’d have thought that a keeper like Szczesny would be used to operating behind a shaky defence after the season he’s had at Arsenal, but apparently the Polish defence is a whole new heap of rubbish. Twice Szczessa came out and both times it was a disaster, the first conceding an easy goal to the Greeks and the second bringing down Salpingidis after a delightful chip over the defence set him free on goal. It was the turning point in the game Szczessa getting the early bath and substitute keeper Przemyslaw Tyton coming on and saving the subsequent penalty. After that it was tedium ahoy as neither side managed to make any real headway. Indeed after a few minutes it became clear that both were happy to settle for a draw and the remaining 20 minutes or so were frankly difficult to watch. Let’s hope this marks the low point in the competition. Things could not have been more different. This was a fast, pacy match where the speed was due not to sides hoofing the ball over the midfield, or crazily rushing at each other in a burst of chaotic attacking play, but to two sides playing direct, on the floor passing games and running into the spaces behind each defence. Russia were one of the surprises of Euro 2008, although they tanked it at the end and they were very impressive here. After absorbing the initial pressing of the Czechs, Russia began to assert control, dominating the midfield and ruling the wings. Amazingly they had a fabulous new player, one Arshavin, who was continually sprightly, always looking for the ball and playing some great defence splitting passes. Surely this can’t be the same sour grumpface who sulked his way out of Arsenal earlier this year (although apparently they are one and the same). And while the Czechs did come back to make it 2 – 1, the Russians quietly reasserted their dominance and it was game over. While it’s undoubtedly a good thing that a bit of intellectual analysis is being applied to football, in particular the increased use of in-game/prozone style statistics to monitor a player’s activities over individual matches and seasons, there’s a danger of developing a simple set of ‘dumbed down’ numbers that are positively counterproductive. 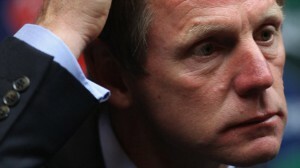 Young Engerland manager Stuart Pearce seeks inspiration as those pesky Czechs sneak another goal past his side. Take, for instance, the much over-used ‘possession’ stat. Scorelines aside, it’s close to becoming the single number that defines a team’s performance, a get out of jail free card should the team lose – ‘well, we had the bulk of possession and were unlucky to lose’ – or a great defence – ‘sure we were under the cosh, they had 75% of possession, but we battled through to a win’. But the truth is that possession is not a simple number. As has clearly been shown in this Under 21’s Championship. It ain’t how much possession you have, it’s what you do with it. It’s almost as if we should have another stat, Effective Possession. Take the Young Engerland vs Spain match, Spain had 65% or more possession, dominated the game, yet still only managed to get a draw by virtue of a deliberate handball. Hardly the stuff of dreams. So much so that it spawned Engerland manager Stuart Pearce’s comment that ‘if we had 60% of possession, we would be winning games four or five nil’, a remark that is bound to come back to haunt him, if it hasn’t already. Not least from this game, where it was Engerland who had 64% of possession, but were fundamentally unable to impose themselves on the game. It all comes down to what you do with possession. The Czechs it seems were happy to give possession to Young Engerland, knowing that Young Engerland were incapable of doing anything significant with it, and for the millionth time, simply passing the ball aimlessly around the back four as they try desperately to figure out what they’re supposed to do with the strange round white thing at their feet doesn’t count as effective possession. Sure Young Engerland scored, but it wasn’t until the 76th minute, and once they did things appeared to fall apart. The Czechs, with their progress to the semis in doubt, immediately changed their tactics, pushed forward and eventually equalised. Then, with Young Engerland forced forward in a desperate attempt to score so that they would qualify, the Czechs applied the hammerblow and scrapped in a winner. You could call it unlucky, but the reality is it was an accurate reflection of a side who simply can’t control games. Once again, Young Engerland came across as having all the qualities and failings of the senior side. A bunch of undoubtedly talented individuals who somehow become less than the sum of their parts when put into a team. A team (and I include both the players and the management team here) who appear to have no tactical understanding, no ability to shape or change a game and no ability to react intelligently to on pitch events. You sensed that there was no concept of how to effectively manage the transitions of the game, to move from defence into possession, into attack. No understanding of what the strengths and weaknesses of their opponents were and how to effectively deal with or exploit them. And no thought as to how to make these individuals gel into a genuinely strong team. Once again, an English team is defeated by the tournament process. We seem to have got to grips with the qualification process, which in itself is no mean feat given that neither France, Germany, Portugal nor Italy managed to get through, but we haven’t yet mastered the experience of tournament football. Pearce looks like a manager who is adept at selecting the most talented 11 individuals for a match (although his choice of Mancienne as a holding midfielder was a classic case of finding a square hole to keep his captain on the pitch), but not the best team. And for qualification, that’s probably all that’s needed, after all any single qualification match is going to be dogged by inevitable injuries and pull-outs, so the team pretty much picks itself. In tournament football, where you have a squad of players, you have to build a team. Statistically speaking, Loserpool’s new wunderkind, Jordan Henderson, may be every bit the £20 million manboy talent they think he is, but if he can’t link up with Smalling and Jones in defence providing a conduit to the attack, then he’s a lot less useful to this team. Similarly, if the defence can’t find a way to move the ball forward other than bloody minded hoofery, they’re only fulfilling half of their responsibilities to the team. Welbeck and Sturridge may have the most effective movement of any striker in the world, but if the midfield can’t supply them the ball occasionally, there’s something seriously wrong with the system. Increasingly we’re hearing a lot of talk about ‘footballing brains’, as if they are somehow different from the brains that ordinary mortals like you or I are issued with at birth. But the truth is that both players and managers should be judged less by the brains they have than the choices they make both during and around a game. Pearce’s choices of Mancienne in an unfamiliar midfield holding role and Henderson in central midfield appear to have been poor and his decision to stick with both of them throughout the Ukraine match seems to show a lack of both adaptability and imagination. Lansbury might appear reluctant to leap into a tackle unnecessarily, but he was much more effective than Henderson at moving the ball into dangerous positions. Great teams, tournament winning teams, adapt as the tournament develops, subtly altering structure and formation as they search for the perfect fit. And, inevitably, they are rarely simply the 11 best players or the 11 fully fit players you get during qualification. We think of Jimmy Greaves, undoubtedly Engerland’s most skillful player at the time, who played not a minute of the 1966 World Cup final, but more recently neither Fernando Torres nor Cesc Fabregas started for Spain in last year’s World Cup final and it was Villa, rather than Torres who grew into the striker’s role as the tournament progressed. Indeed Torres, like Greaves before him, found himself being edged out of a team that was somehow more effective when his mercurial talent wasn’t there. Indeed, Spain typify the kind of adaptation that teams need to display to win tournaments. Their initial loss to Switzerland provoked something of a crisis of confidence, challenging the entire playing ethos of the team. And the Spanish adapted, using fast, mobile substitutes earlier on in the game, when their opposition had become worn down by their attacking possession play and space opened up. And, increasingly, it was Torres who was sacrificed for players like Llorente. Too often Engerland, Young and Old, are seduced by the cult of the individual, the delusion of the ego. We spent years (entire championship cycles) trying to adapt our formation so that both Lampard and Gerrard could play in the same side, deluding ourselves that two players who fundamentally play the same position, could be accommodated without damaging the team by making at least one of them (frequently both) play out of position. We invent an entirely spurious ‘left wing’ problem because we have to have somewhere to put our extra midfield ego. And still, it’s enough, thanks to seeding and the relatively forgiving nature of the qualification process, to get us to the main event. However, once there, the game moves beyond the egos of individual qualification matches to the team-focused requirements of the tournament. And there we fail. Somewhere around the last 16 mark, as we gaze doe-eyed at the superior teams ahead of us. This Young Engerland side wasn’t bad. They qualified, beating some relatively serious countries along the way. And, yes, they were in a challenging group. But in three games, they never once looked like seizing the moment, imposing their will on a game or being realistic contenders. And that’s a harsh lesson to be taking away. It’s going to take a long, long time to sort out the fundamental failings in the system. So we’d better start right now.